Doris Jane Monson was born March 31, 1928, on the family farm near Paynesville, the daughter of Albert and Anna (Gehrke) Heitke. Doris grew up on the farm where she attended a small country school through the 8th grade and then went on to Paynesville High School where she graduated with the class of 1946. On April 30, 1966, Doris was united in marriage to George N. Monson at Salem Church in rural Paynesville. This union was blessed with a daughter, Jane. The family made their home in Hawick. After two years of marriage, tragedy struck, and George passed away. After George’s death, Doris and Jane moved back to Paynesville to live with Doris’ twin sister, Delores. Doris worked at the Paynesville Schools, Assembly Grounds Campground, and Paynesville Good Samaritan Center. She was a hard worker and loved by all that worked with her. 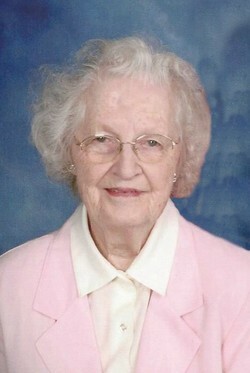 Doris was a member of Grace United Methodist Church in Paynesville. She was active in the Women’s Circle, teaching Sunday School, helping on Funeral Committee, and attending Adult Sunday School. Doris also enjoyed the flower shows through Grace Church, gardening, cooking, baking, homemaking, and loved teaching Sunday School. Doris J. Monson died February 4, 2019, at the age of 90. She is survived by her daughter, Jane Monson of Paynesville; twin sister, Delores of Paynesville; and many nieces and nephews. Doris was preceded in death by her parents, Albert and Anna; husband, George; and siblings Clinton Heitke, Irene Schindel, and Ethel Heitke.